Starting in part seven of this series, I thought I’d flip the coin over and talk about when price and volume actually agree. I’ve written a fair bit about the edge that can be gained by watching for a proverbial scuffle to break out between price and volume, Fight Club style. But you can also use price-volume agreement to your advantage to reduce your overall information risk for a trade. What’s information risk? Well, in a nutshell, there are (at least) two kinds of risk you can incur in deciding whether to act in or around a trade. And it’s hard to talk about information risk without talking about price risk at the same time. 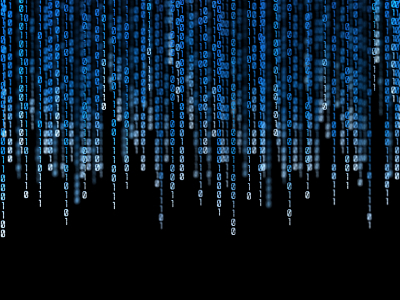 Price and information risk are twins conjoined… yin and yang… a zero-sum pairing. 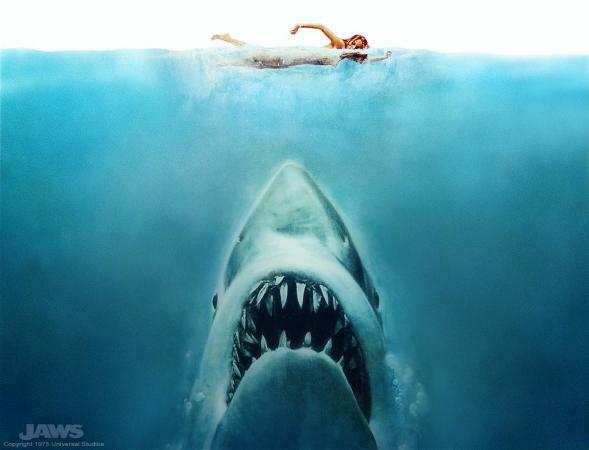 The first kind of risk – information risk – is the bigger threat to your P & L over time. Information risk is when you wait too long to take action because you’re seeking confirmation or additional information. Here’s a scenario. You’ve done your homework, and during that homework you saw 1350 in the ES as an important level. In your plan you noted that this price should be strong support on a test from above sometime during the day. And you think that 1347.50 would be a good stop placement for what could potentially a 10-point trade. That’s a 2.5 points of potential risk for 10 points of potential profit. Nice. But when price comes to your level, 1350, instead of getting long (or scaling out of your short) you wait. It was in fact a good support level, and buyers step out of nowhere en masse right there at 1350 and price rockets up from that level. Knowing you were right and seeing its a good trade, you decide to take action and by the time you get your orders in price is at 1353.50, and you can’t get filled until 1354. You still have that same potential for a 10 point swing, but there’s just one trouble. You’re stop is not valid at 1351.50 – which is 2.5 points below your actual entry. 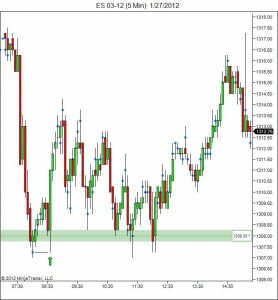 You can place the stop there but it’s quite possible – likely even – that you’re going to get taken out at a loss during what would be a normal rotation before more upward movement. 1347.5 is still the only “safe” stop for that particular trade. And for your entry as executed (not as you planned!) that means you have to take 6.5 points of risk for only 6 points of potential profit. Not so nice. And there it is. You’ve sabotaged your risk-reward ratio and your profit potential in this scenario because you took excessive information risk. Price risk, as it turns out, is not really risk at all. In fact it should be called price reward. As you can see above, the actual trade-off is between taking action when you don’t yet know what’s going to happen for sure or waiting for more information. Knowing and/or waiting, in trading at least, can really cost you. But you can mitigate your information risk. That’s what your price and volume analysis tools are for. It’s not just that they are pretty, cool and even pretty cool (ha), it’s that they can help you mitigate and manage your information risk in real time. And there was one unusually clear example this week that, not by coincidence, could have aided any trader embroiled in the scenario above. Note the prices in the actual chart below don’t match the scenario above exactly. I used round numbers above to make it easier to explain. But the idea is this – you expected buyers to step in at your 1350 price. They did. Your tools – the Acme Volume Impression in this case – were giving you clear visual evidence that your hypothesis about the trade was correct. Price is doing want you expected. Volume is very clearly agreeing. So what’s the right thing to do? When? Which kind of risk do you really want to take? This one picture answers all. 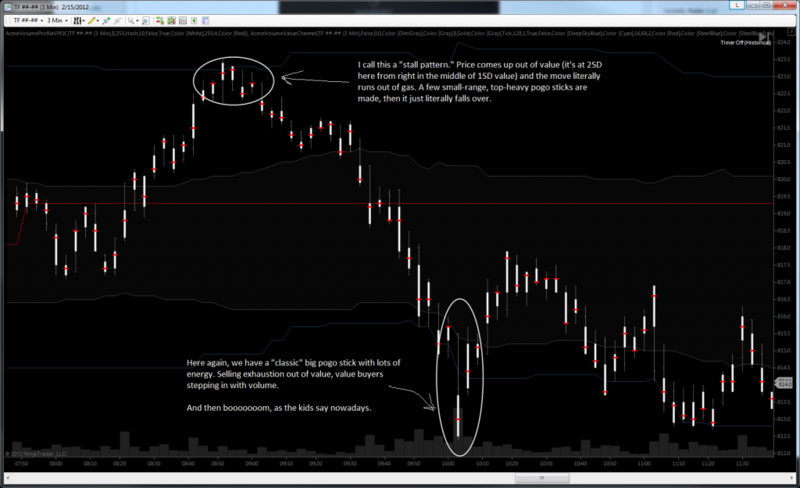 Today, in part four of the Trading for Value series, we’re going to break it down and lay it out. We’re going to spread some of the most important pieces out on the workbench and see how they all fit together. It’s going to be a bit technical. Maybe even a little dry by comparison to some of the other installments. But that’s because a lot of information is going to be packed in here. So grab some coffee (or an adult beverage depending on the time of day, of course) and read on. And then lastly we’ll examine several charts in several markets to show the kinds of instruments on which this kind of analysis yields the most and clearest insights. I’ll say right up front that this is not a Swiss Army Knife of an analysis tool. It does not work well on every instrument and trading situation. In fact, it’s pretty specialized and intended to be used on very short time frames. And as great as it is shaping up to be at aiding the trade in certain instruments, it’s only just ho-hum on others. Let’s do a little “level setting.” No, this is not a trading pun. It’s a bit of jargon we used to use before a big meeting at a certain monstrously huge software company where I worked. It means we need a little context before we get to the heart of the matter. An informational appetizer, if you will. The most important contextual assumption below is one that is so ingrained in my thinking I often forget to mention it. And that piece of context is that most all patterns are only worth your attention at prices or levels you have previously identified as important. At other times (or prices), patterns of most all kinds should be considered noise. It’s only at or near real inflection points that action of any trading kind should be taken. And one of the most interesting things about real inflection points is that they are pretty predictable. The exact wrong approach in most any trading method is to act on a trigger or signal at just any old price. Some prices are way, way, way more important than others, and for the purposes of this discussion please pretend that the examples shown are in fact important prices. We could literally be here all week if I went through the entire process of price/level triage, and you’d never make it through to the end. I might not either. The handle/spine, which is actually the bar range. In this particular case, it’s an OHLC bar. It’s the central support, if you will, for the whole thing. 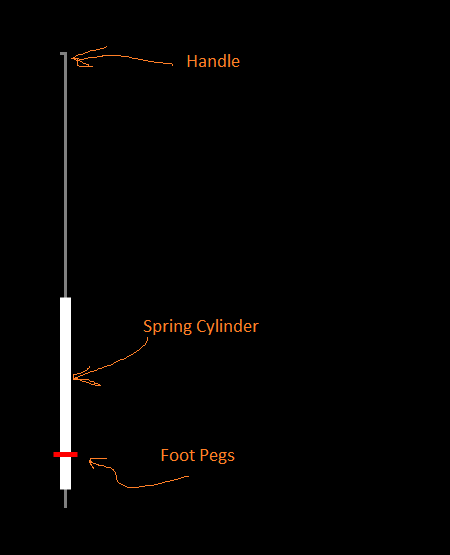 The spring cylinder. In a real pogo stick, this houses the spring that gives the toy its rebounding energy. So it is with our value candle. It’s the 1-sigma value area of the bar and it’s where the bulk of the bar’s energy is stored. The foot pegs. 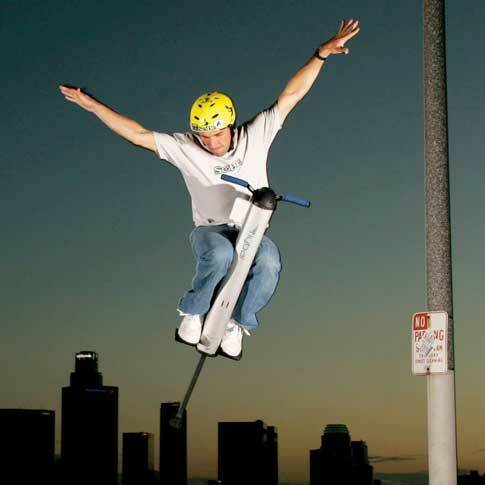 In a real pogo stick, the pegs are attached to the internal spring. When compressed by human weight against something solid, they cause the rider to rebound into the air. In this metaphor, the pegs are actually the bar VPOC, or volume point-of-control. 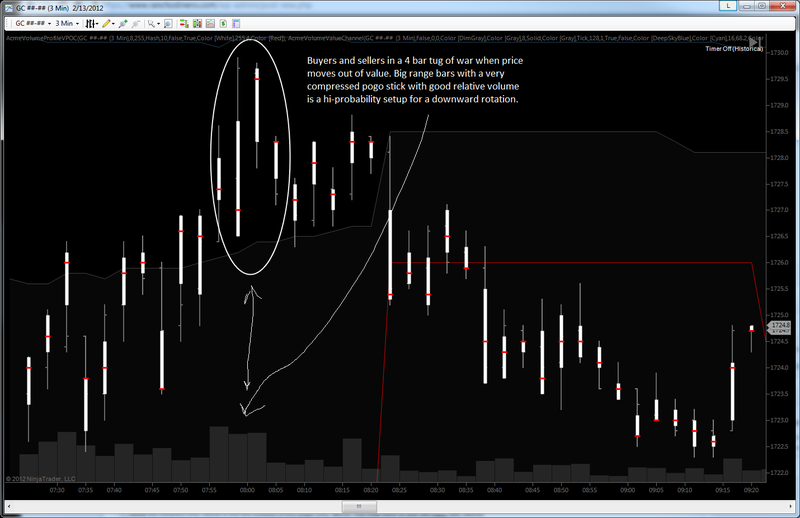 The point of control is simply the price at which the most volume is traded for that bar/profile/period, etc. As we’ll see in a moment, the value candle VPOC very often displays the same rebounding characteristics. The more deeply it is compressed into the value area, the more likely price is to bounce the other direction very shortly thereafter. Now one very interesting characteristic of this particular pogo stick is that it works both directions. Right side up or upside-down, the spring can be sprung. Before we go much further, I want to point out that the value candle concept is not something that we at Acme made up. In fact, it’s something we pared down. 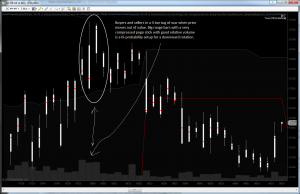 You see, the value candle is simply a volume profile, visually streamlined and reduced to its svelte, naked essence. Let’s have a look to compare. 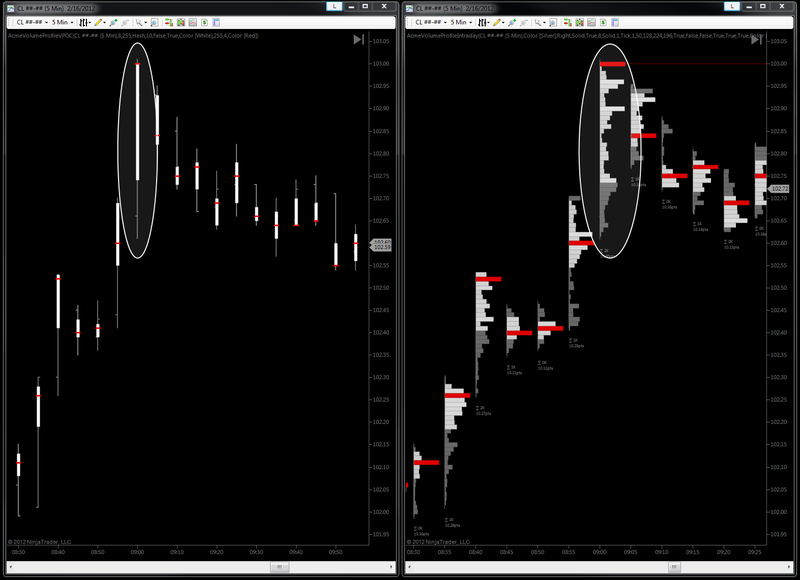 Here is the same 5 minute bar of the same instrument from the same day and time, but “clothed” two different ways: on the right, in a single-bar volume profile; and on the left in a value candle. 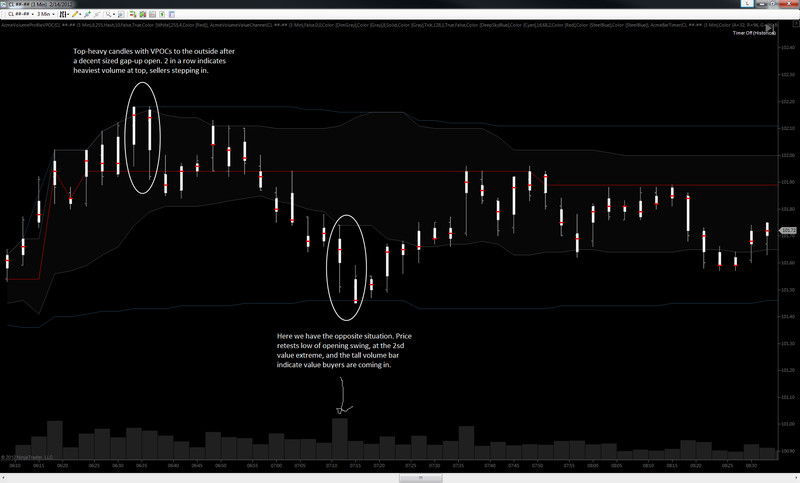 So you can see same essential/critical/most important information is displayed in both the value candle and the volume profile – the range, the value area and the VPOC. Though by comparison, the value candle is much less visually noisy. And as we’re about to see, that increased focus on the essential information can render a rotation-in-the-making easier to spot. So what are the kinds of pogo patterns we’re looking for? Again, generally speaking, we’re looking for the body of the candle (actually the value area, or the range of most-accepted prices within 1 standard deviation of the VPOC) to be positioned toward the outer extreme of the bar range, and also for the VPOC to be positioned toward the outer range of the value area. The further toward the outer extreme the better. Remember, in this metaphor, the outer extreme is the top of the range if price is in an upward rotation, and the bottom of the range if price is in a downward rotation. For the examples below, we’re going to use 3 minute candles. The choice of 3 minutes is pretty arbitrary to be honest. It’s just that for fast-moving instruments 5 minute candles may be too long. And for slower-moving instruments 1 minute is too short. So this is the happy medium I’ve chosen just so we can have a kind of apples-to-apples comparison. One instance of the simple Acme Volume indicator. 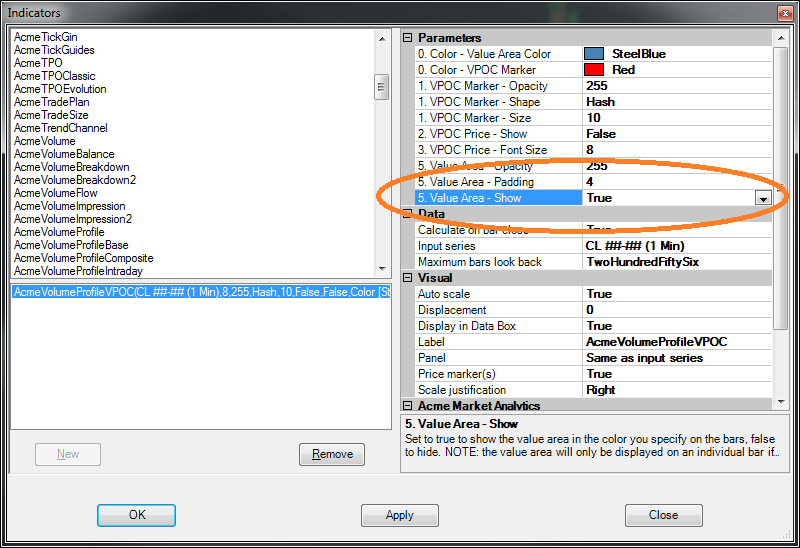 This shows relative per-bar volume at the bottom of the chart instead of in a new panel. One last thing before we get to the annotated charts. I’ve cherry-picked some pretty clear examples. Better to start with an ideal and learn to recognize valid but less ideal examples than the other way ’round, methinks. Next up… gold (GC). Here again we have a swing high and a swing low, though not on in the same session. Pretty similar patterns. A bit trickier to read by comparison, though. Of all the indexes, by far the one that makes the cleanest pogo patterns is the Russell Small Cap Index (TF). Why? While I can’t be 100% sure, it seems to be the least arbitraged of the index futures. Again I need to highlight that this is speculation, and it has fairly light volume at around 125K contracts per day. 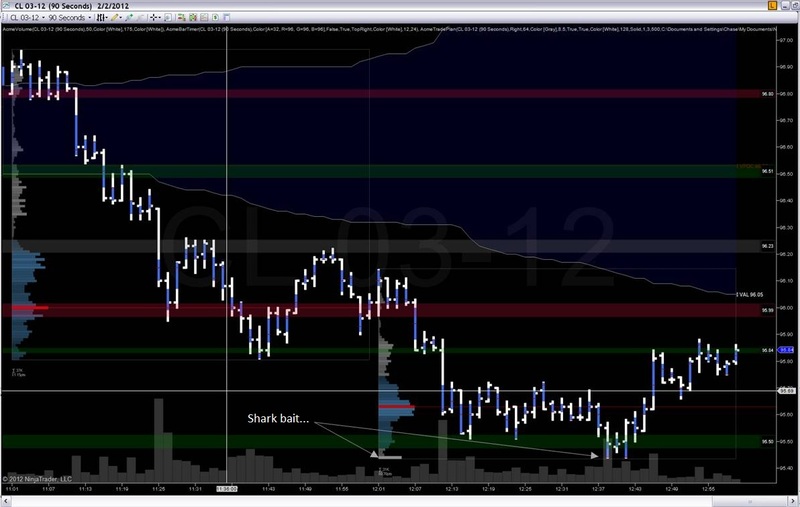 So no matter what, it’s much, much easier to move around than, say, the ES (which we’ll see next). And with that, I’ve saved the worst for last. I think for an instrument like the ES, this really is not the best tool. There is so much volume in the ES with so many players acting on so many time frames with so many purposes all at the same time that it really can’t form clear pogo patterns on most rotations. Value usually takes so much longer to play out in the ES than with many other instruments. Again, mostly this is because the ES is commonly used as both a position vehicle and a hedging vehicle. Meaning that institutions buy a basket of stocks and sell ES contracts against that basket to hedge the position, for example. Still other traders take outright positions on the S&P 500 with the ES contract. Both could be happening at the exact same time, and thus can tend to “confuse” the price action in the very short term. My hope is that this walk-through delivered some clarity on the value candle concept, why it works, what it’s useful for seeing and when it’s not so good too. Again, this is a new concept we’re developing, and so far it’s showing lots of promise. It’s in successful, daily use by a number of Acme traders, a couple of whom you’ve already met, and there are definitely more examples to come. This horse just never seems to die, no matter how many times it gets kicked. As many of you know, when it comes to evaluating buying and selling pressure (aka volume deltas), I am a die-hard up/downtick kind of guy. I really don’t use the bid and ask at all. I’ve gone on ad nauseum on the rationale behind this, especially in the early posts of the price vs volume series. Well I was poking around the Ninja support forums a while ago looking for something completely unrelated when I ran across this quote from ZenFire, posted by Ray from NinjaTrader, which reiterates what I’ve been going on about for oh-so-long. They are reliable, but certainly not synchronized. There are different connect points that may throttle the update of the bid/ask in order to make room for all the trade updates. For colocated machines and in special cases we may give a trader direct connect points knowing they won’t buffer and get behind. Internet users can’t typically keep up and their last trade price becomes stale if they try to pull in the market depth updates. With little importance being placed on the market depth and focus on the last trade, more users can keep up with volatile conditions. The actual thread is here if you want to read it. By the way, this is not a ZenFire issue. No Internet-streamed retail data feed consumer is colocated (meaning your trading machine is physically at the exchange) and therefore might will at times suffer lag in market depth. This is just how the whole system is designed. When needed it tries to ensure timely reporting of the last component of the feed by throttling, buffering or filtering of the bid & ask components (market depth). If you understand this, it can be a strength and you can use it to your advantage. Or at least allow it disadvantage you as little as possible. The fundamental issue is that you’ll never know for sure how much lag you’re experiencing (or not experiencing) without a deeply technical investigation. You simply won’t be able to tell just by watching. And it may be pretty darn hard to know for sure which “connect point” your particular feed has been given – or get a definitive answer from your data provider on this subject. Not trying to assassinate any data feed characters here. Just saying there are known unknowns and they should be respected. 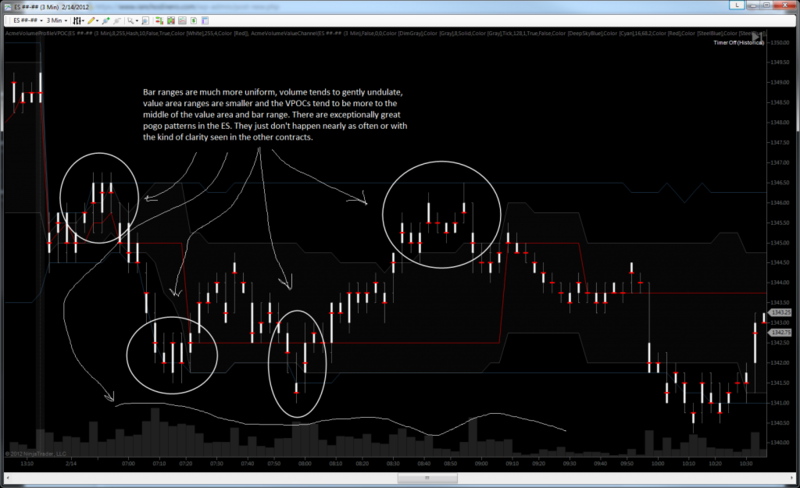 In the last episode of our Trading for Value series, we saw a couple very interesting charts from our intrepid oil trader Danny. Not only does Danny trade oil, but he’s pretty damn funny too. We’ve not heard the last from Danny. One of these days he will show up for an encore presentation, toting more interesting and creative thoughts on trading price and volume. But today it’s all about Phil. 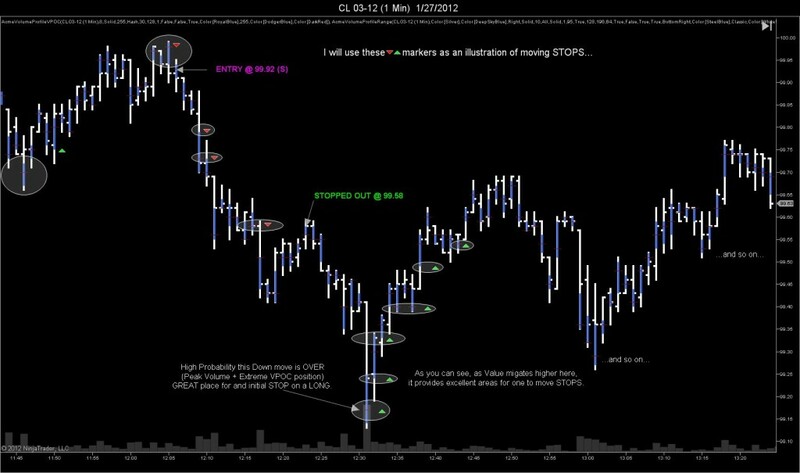 Phil is a Rancho Dinero Pro Member, primarily an ES trader and he’s been using the exact same Acme Volume Profile VPOC study as Danny. Though in a completely different way. 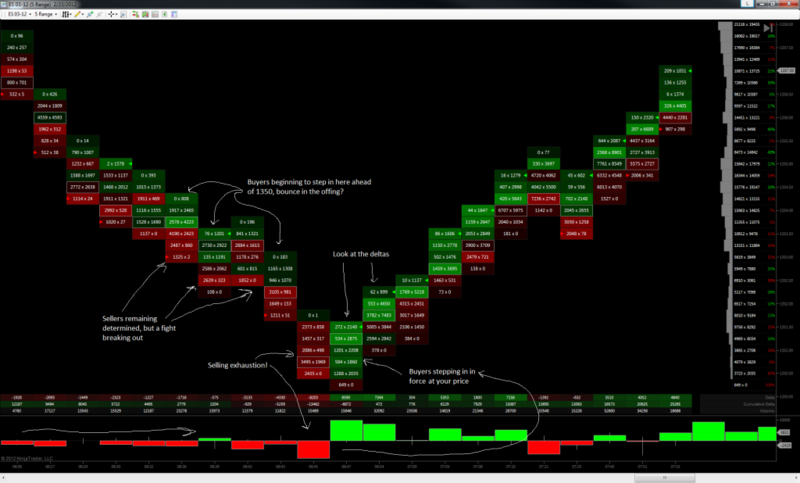 The point of this series, after all, is to show some fresh perspectives on using price and volume instead of or in addition to the kind of volume and TPO profiling many of you know so well. Anyone that uses profiling in their trading will know that the basic theory behind it is that of price discovery. Profiling is a great aid in helping determine levels of interest as it clears up much of the noise that may be missed by the just looking at the chart. In profiling theory price discovery rotates between balances which can usually be found by looking for the low volume nodes that surround a high volume node in a composite chart. That being said, something I have found to be of use is the application of this same idea down to the micro level. One of the tools in the Acme suite, the AcmeVolumeProfileVPOC, allows you to see clearly where the majority of volume is being transacted per period in your charts. In my experience I have found that once you have determined your levels of interest (be it through a composite or simple support and resistance) you will want to have as much information as possible for you to make a decision whether to engage or not at those levels. In my trading I use a combination of divergence indicators to determine selling or buying pressure at this point and combine that with the AcmeVolumeProfileVPOC to see where the volume was done. 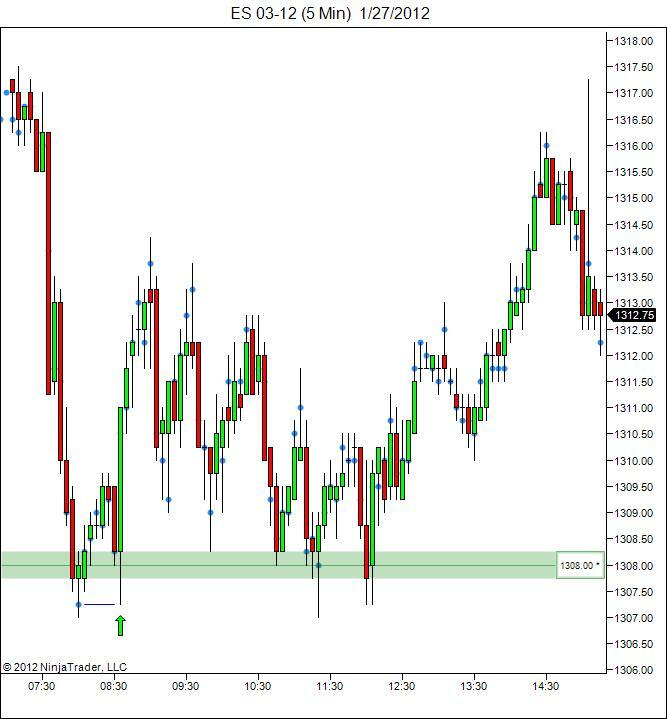 Whether I am looking to fade a move or enter on a pullback, I want to see that a vpoc was created around this level and that the price action is showing clear rejection of the vpoc in the way of continuation or a counter move. Once this happens I look to enter in the desired direction on the retest of this vpoc which usually happens in the next or within few bars after. In some cases the retest is very quick so like anything in trading you have to be ready to jump on the opportunity when it presents itself. 1) Going into this past Friday, prior to the open I determined what levels I would be looking to engage in using a micro composite chart for the month of January along with a range profile for the previous swing that we are currently trading within. As you will see the micro composite for the month (ETH) showed that the highest participated price for the month was 1308, I therefore expected that 1308 would find buyers and sellers and looking at the previous move off of this price and the trend for the month, expected that buyers would be present. 2) As you can see also from these charts, 1308 and its surrounding volume nodes were bought and rejected the price drop during globex into the RTH open. 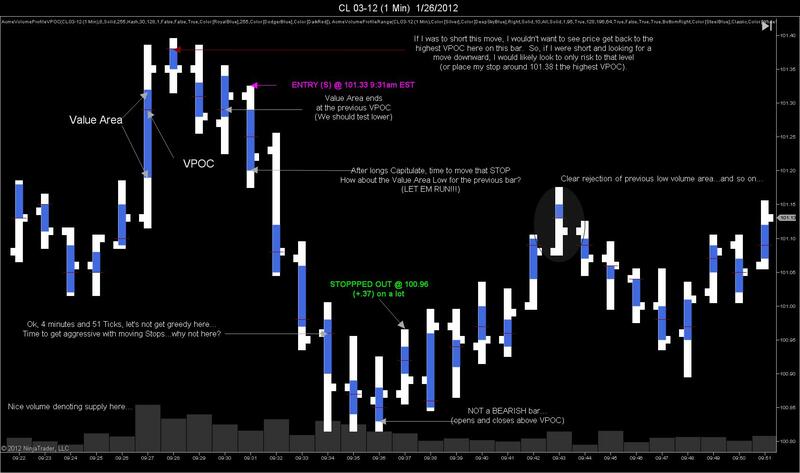 In the 5 minute chart with the VPOC indicator you will also see that there was a vpoc on a wick of a clear reversal candle. 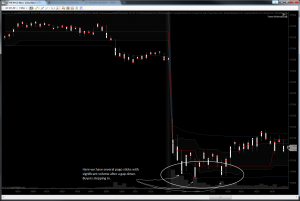 This in my book means price got to that level and sellers were absorbed by enough buyers to be able to stall this move. 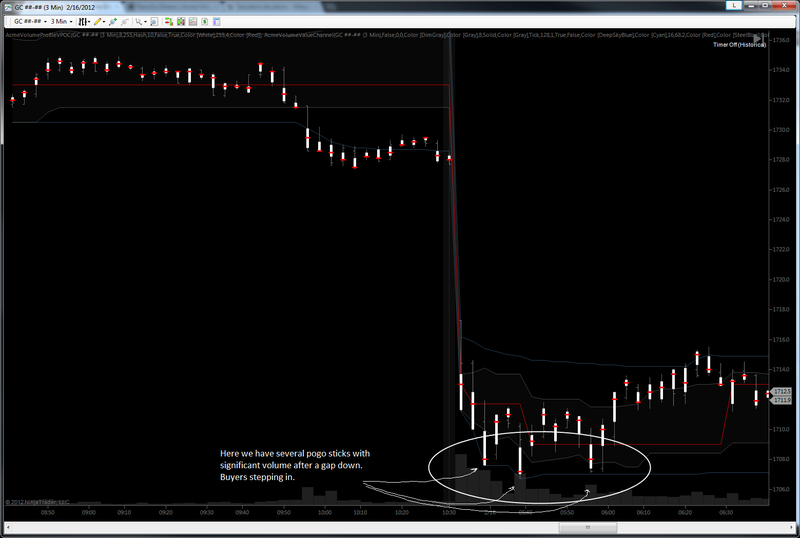 As a result we knew saw a small bounce from this level into this open. 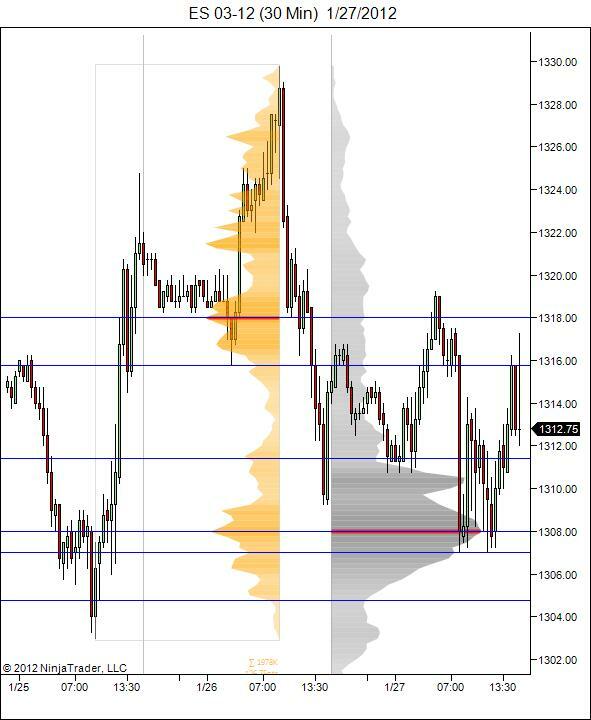 3) Once the RTH session got on the way, we saw a retest of this vpoc at 1307.25 to the tick where buyers came in and a prepared trader could have bought at first sign of stalling or rejection (or however you determine whether or not to engage), with minimal risk (stop below the lows) for a possible bigger pullback of the globex drop to a previous area of resistance which in this case happened to be around 1313.50 where we saw congestion on the way down. As you will see there are many other examples on this chart and as with anything in trading, it requires you be curious and try it out for yourself however I believe the vpoc tool will help you identify areas which are likely to be retested for a rejection and/or continuation with defined risk/reward parameters. 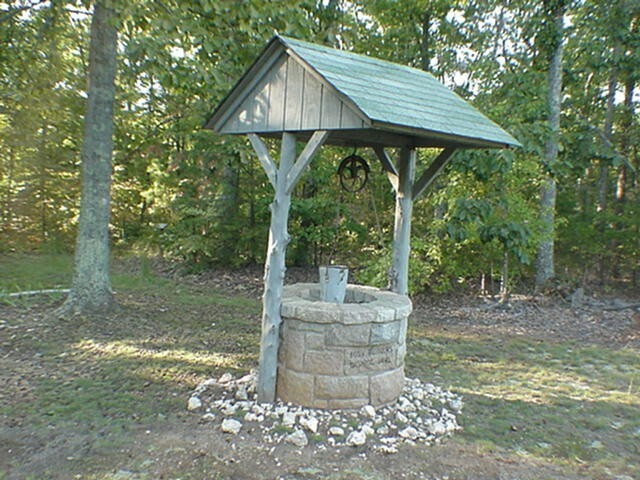 Again, amigos, this well is proving to be deep, clear and mighty refreshing. We’ll be raising another bucket before you know it. And if you like what Phil had to say or you have questions, be sure to leave a comment. No doubt he’ll be around to appreciate and answer. In keeping with the “now for something completely different” theme, today we have a new post in a new series with a new instrument with a new strategy based on a new indicator by a new trader. How’s that? Well, I’ve asked a couple of the Acme loyal to give some thoughts on how they Trade For Value™. This particular trader and Rancho Dinero Pro Member is not new. In fact, he might be quite old. We’ve never met in person so I can’t say for certain. But in any case, I can say with certainly that he’s new to you and that he knows his stuff. He makes his living mostly from fossil fuels – namely trading the CL. As many of you know, the ES is my steed of choice. And so I thought it’d be interesting for everyone if we trotted out a horse of a different color. The trader wished to remain anonymous, but let’s call him Danny. Why Danny? Well that was the male lead in Grease, of course. And this is about oil. So there you go. I can’t really believe I chose that name because in fact I can’t stand musicals of any kind. But there it is. Danny has been working with me on a new concept I like to call value candles. 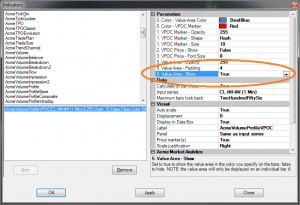 Value candles are a new feature of the Acme Volume Profile VPOC study in the Acme Volume Profile Pack. … then adjust things to your liking. … to form the basis of our interpretation of the price action? Wordy there, I know. But the irony is visual vs literal. This way of seeing the price action could hardly be simpler, and it uses both price and volume in a new way. So there’s the set-up. 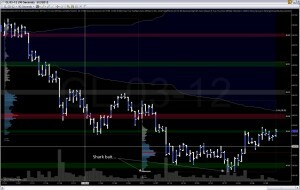 In some charts below, Danny walks us through a couple of swings on very short-term (1 minute) bars in the CL, and calling his actual trades as he goes. As you look over these charts, keep in mind what the factors above are telling you (and him) about what you’re seeing (and what he saw). Let go any pre-conceived notions you might have, and try to see the price action through the lens described above. Maybe it might inspire something new about how you trade your own instrument. You never know until you try, right? Without further delay… let’s let Danny take it away.